A 30-minute meal that can be enjoyed as a hearty dinner sandwich or as a topping for rice, pasta or couscous. 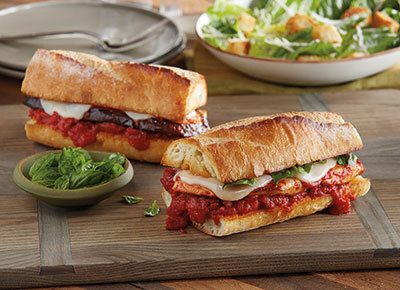 Try the tasty meatless option with eggplant. Season chicken on both sides with garlic powder and salt and pepper, if desired. Heat oil in a 12-inch skillet over medium-high heat. Cook chicken 4 minutes on each side. Combine diced tomatoes and tomato paste in a medium bowl. Pour over chicken; cover and cook 5 minutes. Place a slice of cheese over each chicken breast. Cover and cook 5 minutes over medium heat, or until cheese is melted. Serve in a sandwich roll or as a topping for pasta, rice or couscous. Substitute a large 1 lb. eggplant, cut lengthwise into 4 slices, in place of chicken breasts. Cut a French bread loaf into 4 pieces; slice each piece in half lengthwise. Brush inside with olive oil and toast in a 350 degree F oven. Spoon some sauce over bottom half of bread, top with prepared chicken or eggplant. Top melted cheese with chopped fresh basil and/or a pinch of dried red pepper flakes, if desired. If chicken breasts are very large, slice 2 large chicken breasts in half horizontally to about 1/2-inch thickness to create 4 pieces. If too tart or acidic, add 1/4 tsp. sugar and stir well. If too bland or sweet, add 1/4 tsp. red wine vinegar and stir well. Taste and repeat, as necessary, adding 1/8 tsp. sugar or vinegar at a time until the right balance is achieved.